The people who traveled on the Mayflower to Plymouth, Massachusetts to set up a colony did not call themselves “Pilgrims.” They were not exactly Puritans either—more like a radical wing of Puritans. (Pilgrim is also a descriptive word—it describes a traveler who journeys to a holy place.) They were a religious congregation of Brownist English Dissenters who had Robert Browne, an Anglican priest as their leader. Browne was influenced by Thomas Cartwright who espoused the Puritan theology of reformed Protestants. The Pilgrims disapproved of the Catholic Church and believed that ritual and goodness do not make a difference in salvation. They also believed the Catholic leaders were living ostentatiously. King Charles I persecuted the early Protestants and forced impossible economic policies on them, as he was in favor of the Church of England and it was closely aligned with Roman Catholicism. Acting as Separatist’s then, Pilgrims left England for the Netherlands. Having a hard time acclimating to the work, culture and language there, they arranged to set up a new colony in North America and bargained their income and talent futures for passage. The Indians the Pilgrims met were Wampanoag Indians of coastal Massachusetts. The Indians were indigenous, which means they were already living in the United States for thousands of years before the European colonists arrived. Colonization is harsh. European people who were adventurers and speculators went to a foreign land, captured the natives for slaves, took the resources from the land and profited from everything after that—settlements and European royalty payments and plans. That was the way it was, along with piracy on the high seas. In America at the time of the 1600s, Spanish explorers had colonies mainly in the Southwest and Florida. The French claimed the territory along the Mississippi River. One event really set the tone for disruption with the indigenous Indians. Captain Thomas Hunt, an English adventurer, kidnapped 20 Wampanoag’s and 7 Nausets, enslaved them and sold them in slave market in Malaga, Spain. Amazingly, the Pilgrims were to meet one of those enslaved Indians again. There was an English settlement before the Pilgrims. It was the founding of Jamestown, Virginia in 1607. Previously there was an ongoing conflict over the Spanish monopoly in America, so much so that it became one of the issues that made Queen Elizabeth push for settlements. The English claimed that John Cabot of Bristol sunk the first English flag in 1497 when Columbus and the Spaniards were still dallying in the islands off the Caribbean. Eventually, English people developed settlements on the Atlantic coastline and in New England all the way to the Appalachian Mountains, ultimately numbering thirteen colonies by the 1770s. Jamestown was nearly decimated by an Indian massacre in 1622, when the Powhatan tribe killed 347 settlers, mistreated their bodies and burned crops and camps in retribution for their treatment. The contempt the English had for the natives, their efforts to Christianize them and their pushy expansion policies proved too much for the Indians at that time. 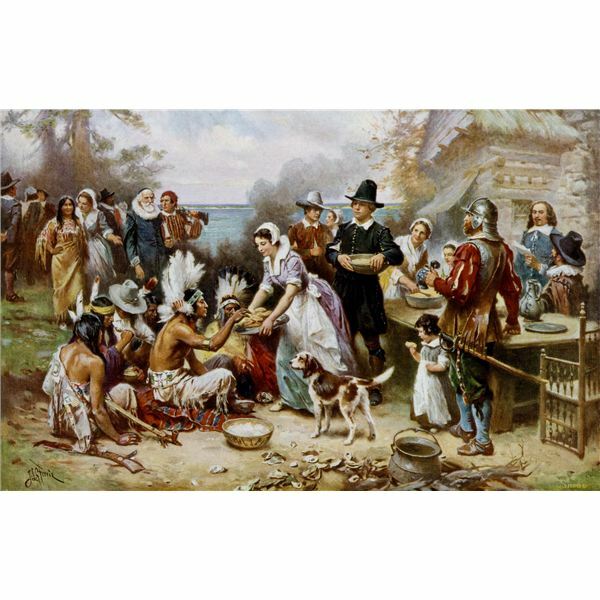 Originally, in the 100-foot-long ship the Mayflower, there were 57 Pilgrims and 48 “strangers” (young people who hoped to prosper as landowners in America, 18 of them indentured servants) and crew. They were all in debt and those adventurers who set the profit-making investment afloat were willing to get everything they could from their investment. Ninety-nine would complete the crossing. It was winter and what faced them was desolate wilderness, wild beasts and wild men. Passenger William Bradford lost his wife to drowning soon after their arrival—she fell overboard and went down in the harbor. Was Dorothy Bradford’s death a suicide? There are written accounts of the Pilgrim’s arrival: it was met with backbreaking work, sightings of dangerous Indians and lots of seat-of-the-pants experiences such as finding water, scouting land, fire-building, setting traps, hauling stores and staying warm. They debated staying at Providence or sailing on to Ipswich, Massachusetts, but in the end, they decided on Plymouth. Another potential patriotic myth: Plymouth Rock. Although some say it is traceable to Dedham, Massachusetts, in reality, there are no eyewitness accounts or mention of any rock. Over the next year, they faced clearing the land; continuous building; fortification of the village; fears of Indian attack; creating a burial ground, fort and common house; and epidemic disease. Whether it was from tuberculosis, smallpox, pneumonia or just working to death, six died by the end of December, eight in January, seventeen in February, thirteen in March and another six later in the year. Half the company was gone and a scarce 50 remain. A visitor wandered into the village alone. The Pemaquid chief, Samoset, from Monhegan (Maine), told them about the local Indians and warriors. He had learned English from the fishermen in the north. He returned one day with another named Indian named Tisquantum or Squanto, the only surviving native of Patuxet (Plymouth). He spoke English too, because he was one of the slaves Captain Hunt had sold, but he had made his way to London and then back to America. These two helped to engineer a pact with the Massasoit tribe for peace and nonaggression. Both the English and the Indians were desperately weak and vulnerable. For now, the balance of power was slanted toward the English a might. Edward Winslow wrote a description of what came to be the first Thanksgiving—an eyewitness account—but he embellished it. A shorter account written by William Bradford, one of the Pilgrim’s leaders, came from Winslow’s book published two years after the Pilgrims arrived, called Mourt’s Relation. Winslow’s account was more like salesmanship. He wanted more Englishmen to immigrate to Plymouth. The uncanny part of the whole thing is that the Pilgrims did not sanction “giving thanks” with feasting, but fasting. They also disapproved of religious holidays and took them as superstitious, wanting to reform the superstructure the church had added over the centuries. There was a shared meal eventually. Turkey was not on the original menu. There was no cranberry sauce, stuffing, mashed potatoes, candied sweet potatoes or pumpkin pie. According to historians, this was just not the case. The menu was more like venison (deer meat), raccoon or beaver meat, with beans, corn and squash. They may have even eaten clams, mussels and fish. The Plimoth Plantation Museum completed a decade of digging at about 10 different sites around Plymouth and only a few turkey bones were found. Aside from the fact that turkeys are hard to kill with matchlock muskets (the guns of the period), the wild turkey was not a New England native. Cranberries are grown in bogs, which was a much later invention. In addition, some things that show up on the modern menu would simply not grow in the cold, rocky soil of the New England region. There was neither sugar nor wheat with which to make a piecrust, although the Indians did cut slabs of pumpkin and fry them. Pecan pie, a staple, appeared in the South, but not until the nineteenth century, when Jefferson Davis took up Thanksgiving for the Confederacy. The Indians produced five deer to eat. The English people had known deer as a “king’s dish”—an aristocratic fare that was not commonly taken. Traditionally, poaching from the King’s deer grounds meant someone could lose a hand. However, in America there was deer for all. Hodgson, Godfrey. A Great and Godly Adventure. Perseus Books Group, 2006. Book. Davis, Kenneth C. America’s Hidden History: Untold Tales of the First Pilgrims, Fighting Women, and Forgotten Founders Who Shaped a Nation. New York: HarperCollins, 2008. Book.